The motivation behind this visualization, besides trying to build something cool, was to showcase the capabilities of my former employer’s Geographic Map API and encourage developers to build map-based visualizations. This visualization is part of the More Than a Map website showcasing the capabilities of the Google Maps API – do check it out. I’ve always been a big fan of Google Maps. I remember looking at the newly released Street View feature in 2007 and shaking my head in awe. And MapsGL released earlier this year produced a similar reaction. What’s great for developers is that they can leverage all of the goodness of Google Maps via the API for free! What will you build? The other day, it occurred to me that one of the oldest and simplest visualizations is the analog clock–it is a visualization of time using angles on a circular scale. A series of concentric circles, going outwards from the centre, represent the hour, minute, second and millisecond. Each circle is colored on a scale that ranges from orange to black. Depending on whether it is AM or PM, the innermost (hour) circle, gets brighter or darker. It is orange at noon and as the day progresses, it gets darker until it is black at midnight. From midnight to noon, it get progressively brighter until it is orange at noon and the cycle starts again. Similarly, the minute and second circles go from orange to black once every hour and minute respectively in the AM and in the reverse direction in the PM. The millisecond circle pulses from orange to black or vice versa once every second. This mechanism is inspired by nature–the overall brightness of the clock is an approximation of the overall brightness of the sky. The main difference, however is a guide inside of each ring that makes it easier to tell the time. In each ring, the point where the color of the ring matches the color of the guide represents the time in exactly the same way as on a traditional analog clock. These points are highlighted using green arrows. If you look at the second ring closely, you will notice that it appears to be somehow moving. This an optical illusion caused by the fact that the point at which the ring and guides match is moving around the circumference of the clock. One of the ways to understand data is interactive data visualisations. Multidimensional data is especially tricky to visualise because of the complexities of each data point, but if done properly, can provide real insight from the macro- as well as micro-level. A great example of this is the “exploding bubbles” technique, presented by Hans Rosling in a TED Talk from 2006. Look for exploding bubbles starting from around 9m30s into the video. Inspired by this, I developed the Exploding Bubbles application using Infragistics Silverlight and Silverlight Data Visualization controls. On the left you will notice a pivot grid showing multidimensional data. On the right is a bubble chart, a visualisation of that data. 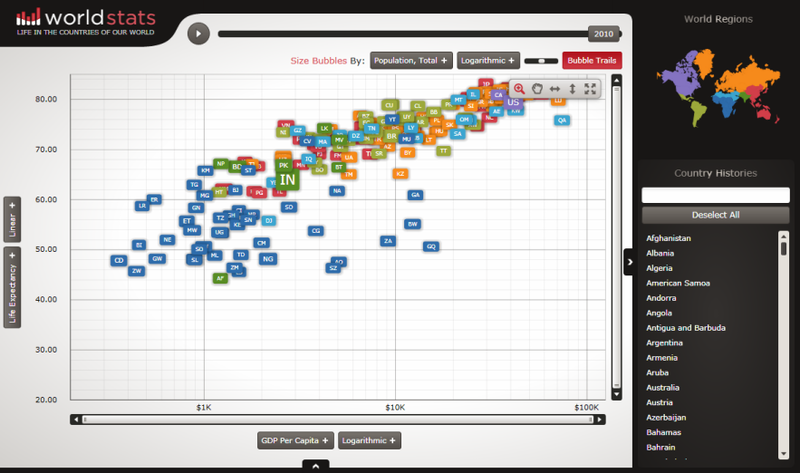 You can also interact with pivot grid by expanding or collapsing rows – the bubble chart is synchronised with the pivot grid’s data. In the meantime, for more details of what you can achieve using these and other Silverlight controls from Infragistics, you can browse through the samples and read the documentation. If you want to know what the future holds, or find out about the most brilliant and innovative work being done in any field, there is no better freely available resource than TED videos. My inevitable reaction to a new TED video is shaking my head and thinking “brilliant, just brilliant”. Like this one from Aaron Koblin, in which he talks about his works spanning data visualization, crowdsourcing, digital art and social experimentation bordering on cheekiness. WorldStats uses a bubble chart, but Motion Framework can be used to automatically animate any type of chart included in our Data Visualization framework including maps!